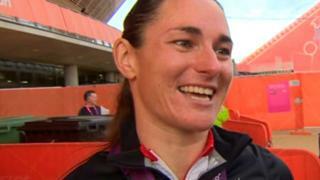 Track cyclist Sarah Storey reveals that being roared on to victory in the Velodrome was like having 8,000 extra members of her family. Storey cruised to the Paralympic gold medal in the women's C5 individual pursuit, after breaking her own world record in Thursday's heats. She is greeted by hundreds of fans at the Olympic Park and tells Adam Parsons about her joy at winning the first gold for ParalympicsGB.